Book News: 'The Great Gypsy'? School Reading List Is Error-Riddled : The Two-Way Also: Embattled celebrity chef Paula Deen to star in a comic book; Nathaniel Rich on noir lit; a profile of a literary fraudster. A school district in Long Island, N.Y., has flunked its own summer reading list. The Hempstead Public Schools list features authors such as "George Ornell" and "Emily Bonte," (properly spelled Orwell and Brontë) alongside dozens of other spelling and punctuation errors. 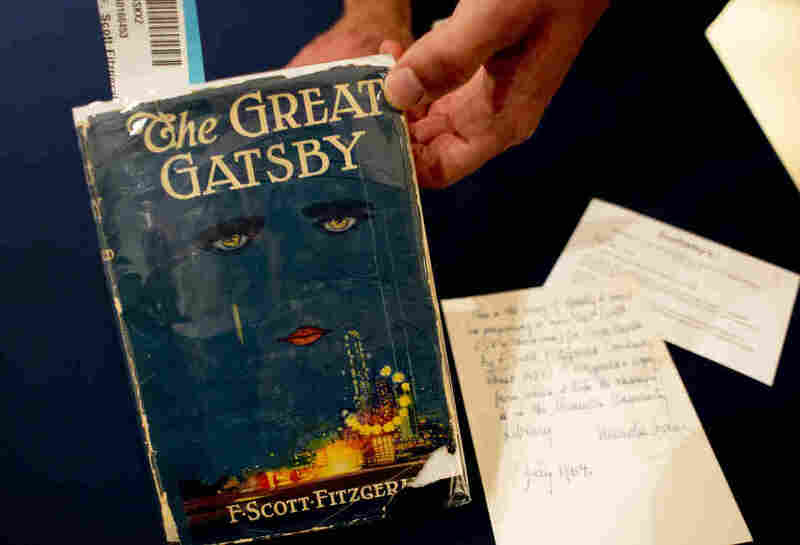 Most memorably, the list — which bears the motto "Those who read more, achieve more" — refers to F. Scott Fitzgerald's novel The Great Gatsby as The Great Gypsy. It's more unwelcome attention for the struggling school district. In a statement to Newsday, Roger Tilles, a member of the New York State Department of Education's Board of Regents, said, "It indicates again that a stable administration is absolutely essential for kids to get the kind of education they need. Hempstead has not had a stable administration for a long time and the kids are suffering." Newsday points out that "Hempstead consistently has been one of Long Island's worst-performing school systems. Its 2011-12 graduation rate of 38 percent was the lowest of the Island's 124 public school districts." At a news conference Thursday, school district spokesperson Alicia Figueras said that "disciplinary action had been taken" against the employee who made the reading list errors. Embattled celebrity chef Paula Deen will be the star of a new comic book, NPR's Mark Memmott reported Thursday. Bluewater Productions announced that it would go ahead with the book despite Deen's recent notoriety, telling Reuters that the intention is not to "flambé her." The company added in a separate statement that "despite her recent failings, we also strongly believe she still has a powerful story to tell; one that fits the female empowerment model of our books." Emma Straub, the author of Laura Lamont's Life in Pictures, writes about her miscarriage in an essay for The Millions: "No one talks about the physical pain of miscarriage. Not that people talk much about miscarriages at all, and certainly not in public, but if there is any acknowledgment, it is of the psychic pain, the emotional toll. That I saw coming. What I didn't anticipate (for who would anticipate such horrors) was the actual pain." The New York Times asked eight novelists, including Meg Wolitzer, Elizabeth Strout (who would like you to know that she reads Tolstoy by the pool) and Colum McCann, what they read in the summer. Odds Against Tomorrow author Nathaniel Rich writes, "Maybe it's because I burn easily, but the sunnier it gets, the more I find myself wallowing in darkness. Early in the summer I start with the low SPFs of noir lit — writers who temper their danger and despair with humor...By July I've usually passed into more psychologically disturbed territory...By Labor Day, there's no way out. That's when I turn to noir's twisted twins, David Goodis and Jim Thompson, and their novels of unrelenting madness and doom." The Guardian's Stephen Moss profiles A.D. Harvey, the historian and fraudster who concocted an elaborate academic hoax convincing Dickens scholars that the author had met Dostoevsky in 1862. The fraud was recently uncovered in an impressive piece of sleuthing by Eric Naiman in the Times Literary Supplement. Moss writes, "For a disappointed would-be university historian who feels he is the victim of an academic conspiracy, he is the happiest man alive." On The London Review of Books' blog, Katherine Rundell writes about the six women who climbed the outside of the Shard skyscraper in London to protest Arctic drilling: "Arresting is the right word. Everything about the climb is enticing and glamorous: the 4.30 a.m. arrival, in the dark, a line of shadows filing up a ladder in torchlight. The illegality, like in an old heist movie. The tough, witty women, too brave for their own good. And the daring of it, such a glorious and gritty madness." Russia's Federal Guard Service — the rough equivalent of the Secret Service in the U.S. — is transitioning back to typewriters, Russian newspapers Izvestia and the Moscow Times have reported. The Moscow Times writes that the move is a result of security concerns following Edward Snowden's leak of secret U.S. documents, adding, "Each of the typewriters will have its own signature, so it will be easy to trace where a particular document came from."